Labour Day was spent at the Begonia Festival Parade in the morning, watching the bands march past, as well as local businesses and primary schools. It’s always fun to see people in the parade that you know, though there didn’t seem as many people there this year. I think a few people were away for the long weekend :). Our front yard is tiny, yet chock full of trees (Japanese maples and a mulberry), roses and agapanthus, with a hedge. I raked, weeded and mulched, and replaced a couple of plants. Roses were deadheaded and ivy yanked out. The maples are beginning to turn, and even on a warm day like today, you begin to feel autumn is here. 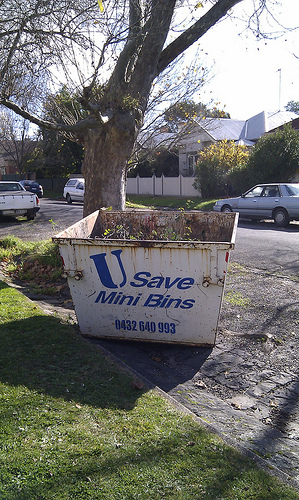 A long weekend, a skip outside our house, can only mean one thing- the garden! We hire a skip every few months or so for largely green waste (we don’t have green waste collection- the council have been dithering about this for years), bits of stuff from the shed, and from the recent garden makeover. Presently we have a lot of leaves (the downside of living in a leafy street), rose prunings and some broken bricks in the skip. I am hoping to add more stuff today, as the sun is out, there is no wind and no rain. With any luck, we’ll crack double figures in the weather! So far today I have swept, raked, levered, bent, yanked, weeded and pruned. On top of that lunch has been made, laundry has been done and dinner is about to be started. Not much of a holiday for me, but I had a lovely day off on Friday so I’m not really complaining :). Pulled out and dug up weeds, started digging out the soil from the circle, and removed the pathway. I also got sunburnt on the small of my back (tshirt riding up and jeans falling down, and no, there are NO photos of that!). The circle is the next to go, once the dirt has been removed. 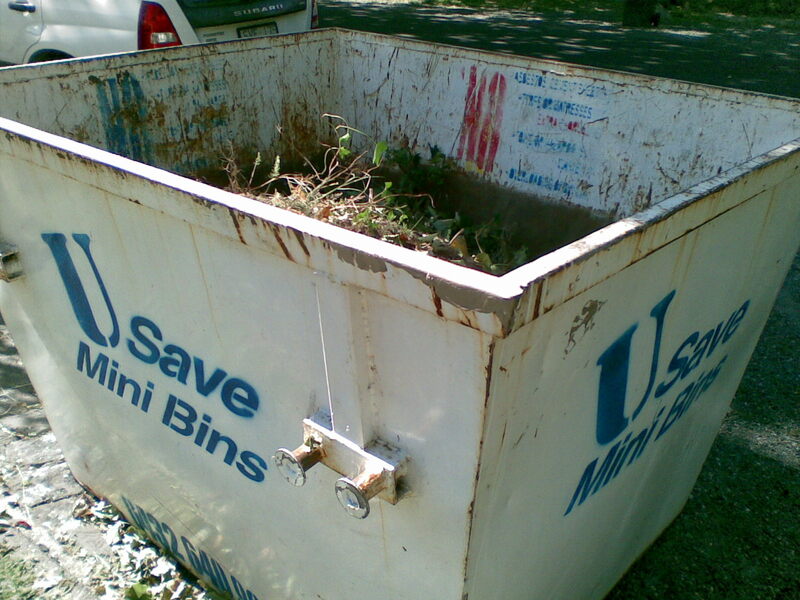 The skip will be hired again in a couple of weeks time as we remove more foliage and concrete from the circle. 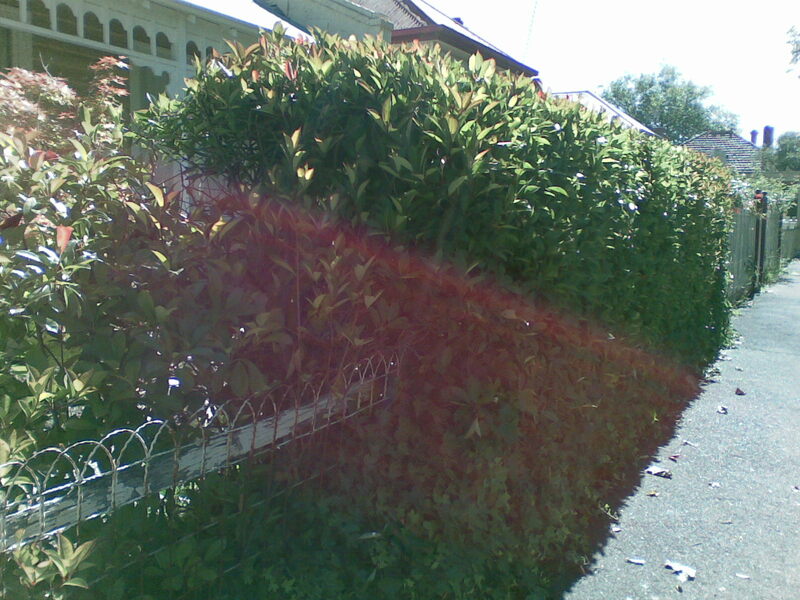 I’m hoping to plant some daisies and ground cover in the front yard soon, and have spoken to our lovely next door neighbour about putting up a trellis on top of the existing fence for a climber such as jasmine or passionfruit. She’s more than happy to split the costs, which is good. Her handyman, Ron, will come around later in the week to put that up, which means a trip to a nursery for plant shopping on Saturday. …wishing Santa Claus gave me a gift voucher for Bunnings for Christmas! Hmmm…so much for blogging the 12 days of Christmas. The spirit was willing, but the internet connection was weak- nonexistent really. My sister in law is a firm believer of maintaining a healthy work-life balance and the presence of the internet would have her bringing work home. So I took photos, and ate, went to the local falls and ate, drank wine and ate, and went out for coffee and ate. More of the Christmas road trip will be revealed over the next couple of days, when I attempt to catch up with my posts. 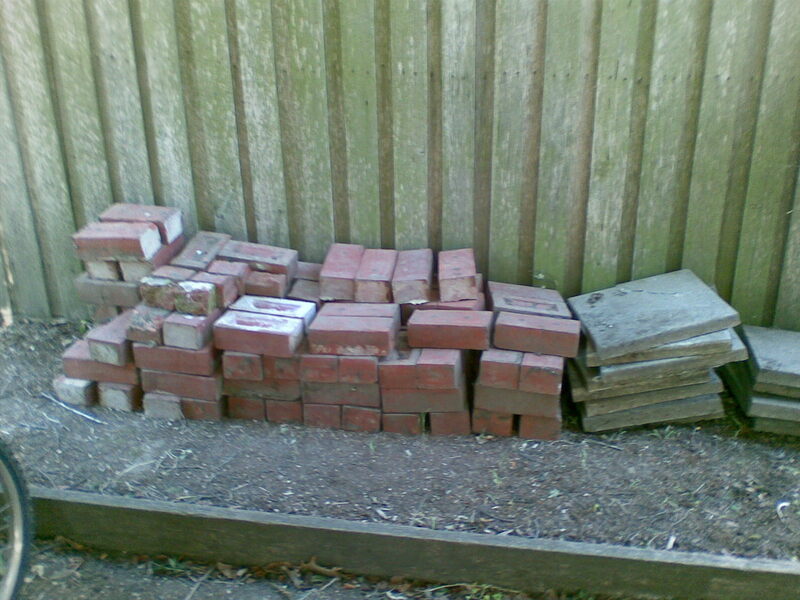 In the meantime, I am awaiting the arrival of a skip into which most of the backyard’s weeds, rose clippings and a fair few broken bricks will disappear. 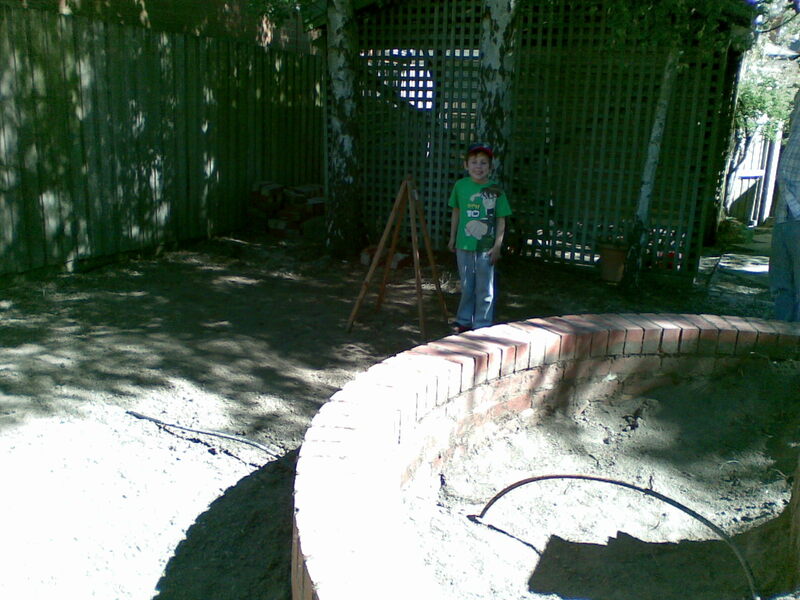 The backyard is set to be transformed from an overgrown wilderness to something with a lawn for the kids to play on, a paving of a barbecue area and the planting of creepers to disguise the fence. 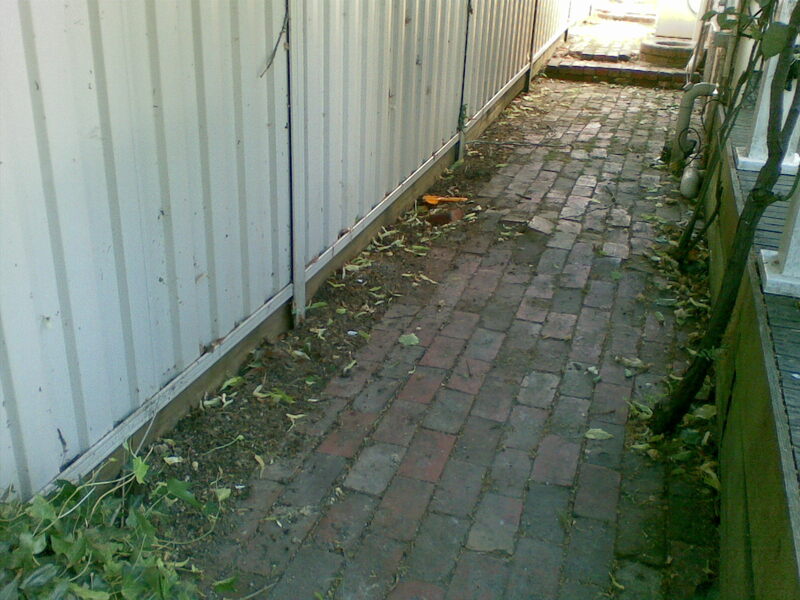 Our house is on a narrow allotment, about 10 metres wide and 50 metres deep, with a slope. From our back deck we can see into a few of our neighbour’s yards. With the advent of summer though, the trees begin to get leafy again which affords a modicum of privacy. The huge trees next door also afford us shade in the back yard in the afternoon. In some ways it feels as if our neighbours are sharing their garden with us. As I have said in a previous post, our garden was landscaped about 15 years ago. Just as houses often hold the personality of their previous inhabitants, so too does a garden. There are aspects that will be eventually changed- ie would prefer brick paving over gravel- but that can wait for the moment. We did a really hard prune of all our rose bushes in July and it’s amazing just how they have sprung into life. We haven’t watered them, yet they are thriving with the good spring rain we had. My favourite part of the garden, would have to be the row of silver birches at the end of the garden. They make a lovely screen, and are incredibly restful to gaze upon when I come back from work, sink into a deck chair and watch the kids play in the sand pit. A full weekend, visiting my parents in Geelong and going to see the latest Harry Potter with Mr Bookgrrl on Saturday. Master and Miss Bookgrrl were suitably spoiled by grandparents with Timtams, lollies and icecream and heaps of attention lavished upon them. Sunday was the resumption and completion of pruning and garden work- well, as much as one could do to completely fill a skip full of leaves and prunings. This was squeezed in between a visit to the monthly craft market, two loads of washing and cooking two dinners- tonight and tomorrow night. I am quite thankful it is over for a while; my hands can only take so much scratches and pricks from rose thorns :(.